ONYX Advantage™ is so much more than a cost effective way to keep your RIP and print workflow software current. It provides an easy way to get all the latest features as we continue to innovate and develop our products. You gain immediate access to ONYX software upgrades, versions and releases as well as the hundreds of new and existing drivers for printers, cutters and color devices. As an added benefit, ONYX Advantage contract holders have access to an expansive library of on-demand videos covering product training and application support. ONYX Advantage™ includes specific programs to match your product. ONYX PosterShop and ONYX ProductionHouse. version are stunning. The improvements I’ve seen really raises the bar. 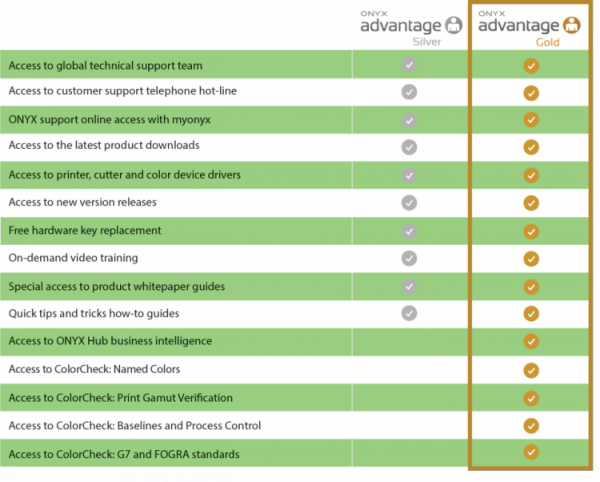 ColorCheck is a module available with an ONYX Advantage Gold subscription. Make future printer, cutter and color device purchase choices easy, upgrade to the latest version of ONYX software through ONYX Advantage and save up to 25% on the cost of product updates over 3 years.